Take, as one example, Father Solanus Casey, who lived and worked for many years in Detroit as the door-keeper at Saint Bonaventure’s (not very far from where I am writing this note). Although he is presently only “Venerable,” this Capuchin priest who died in 1957, now under consideration for beatification, was deeply initiated into the true meaning of life. As a consequence of this initiation he had great confidence in God and a profound love for the poor and sick. A number of books have been written about his ministry to the sick (who would come to see him at St. Bonaventure’s where he was a simple porter) and the many healing miracles attributed to him (from which he got the reputation as a miracle worker). His simple life touched the lives of so many people seeking hope, healing and encouragement, and continues to do so. I have personally sought his intercession at the site of his tomb in the Solanus Casey Center in Detroit, and I know many other people who have done likewise (see solanuscenter.org). Father Solanus, pictured below, is one example of how a “Saint” shows to us the true meaning of life. And Blessed Mother Teresa will be canonized by Pope Francis on September 4th of this year. 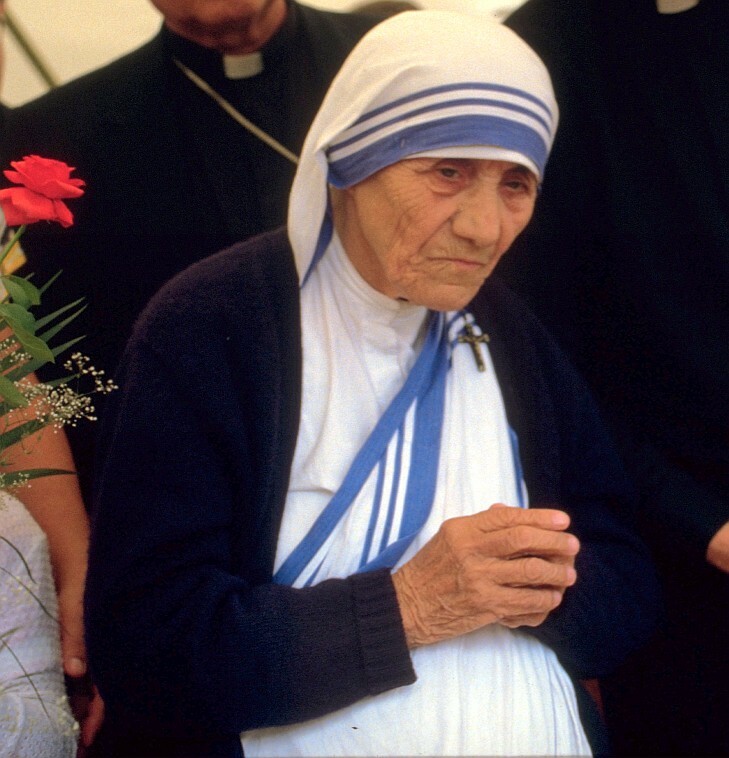 And she too had a huge impact on the world through her devotion to the poor. And, like Pope John Paul II, she made and greatly valued the DeMontfort consecration to the Blessed Virgin Mary. Additionally, she placed a high priority on the Eucharist and Eucharistic adoration. She was always seen carrying a rosary. An excellent book which sets forth the nature of her mystical life, and the communications she received from Jesus and Mary, is Come Be My Light by Father Brian Kolodiejcchuk.